Following on from @gerriohear Lungo deal. 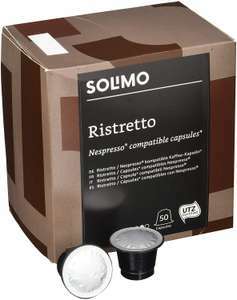 Amazon Nespresso compatible pods £10.83 for 100 so 11p each. +£4.49 non prime. Is this compatibile with Tchibo cafissimo? I ordered a box of these last time and they dont taste any stronger or different to the Lungo. Stick with the Lungo and keep your eye out for a deal on L'or Ristretto if you want a really nice coffee. Just ordered some Lungos - Currently on L'ors at work. Am I going to be very disappointed? Received these today, and they are not nice at all. Tastes like weak percolated coffee, then again that might be your ‘cup of tea’ as they say , but not for me. Just ordered some Lungos - Currently on L'ors at work. Am I going to be …Just ordered some Lungos - Currently on L'ors at work. Am I going to be very disappointed? Nope. These are great for the money imo. Better than a lot of "premium" pods.